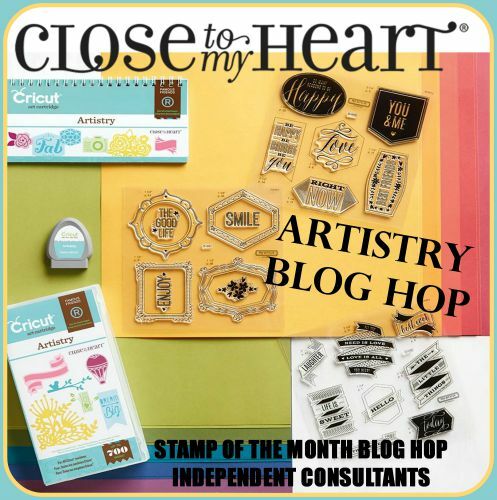 For this hop we have 30 Close To My Heart Consultants sharing their creations featuring CTMH's exclusive Artistry Cricut Bundle including three coordinating stamp sets and a pack of vibrant new colors. If you have come here from Paige Dolecki's blog, you are on the right path! The blog hop is a great big circle, so you can start here and work your way all around. If you get lost along the way, you’ll find the complete list of participating consultants on Melinda’s Blog. I'm loving Artistry and Zoe. It's hard to decide what to do.... so many choices. I like the flower cluster (background pg. 39), I layered it, blinged it,and added the stamped sentiment "Enjoy" and the small flower cluster from the coordinating stamp set D1681. These were stamped on the shape found on pg. 11. I had one already cut from stamping the SOTM in white daisy and cut another slightly larger from Sorbet CS. Now "hop" on over to Gina Brandstetter to see her work! Be sure to visit all th e consultants at their blogs to get some great crafting ideas and other fun ideas! Beautiful card! The flowers just pop. The floral cluster is beautiful! Pretty card. Nice use of the flower cluster. Such a beautiful card Darlys! Love your blingy flowers! Cute card that brings you plenty of smiles!!! Love it, very nice work. Awesome card! Love those flowers. Beautiful card. I love how you made the flowers pop with the different colors.